Lynne has been an active Realtor in the State of Arizona since 1990 and is currently affiliated with West USA Realty in Scottsdale, Arizona. She has been a Realtor for over 33 years. Lynne is a multi-million dollar producer and obtained her GRI designation from the Graduate Realtor Institute in 1996 and her CRS designation from the Residential Sales Council of the Realtors National Marketing Institute a National Association of Realtors Affiliate in 1997. Lynne also has her CMPS designation. She is also a graduate of the University of Maryland located in College Park, Maryland where she obtained a B.A. Degree in 1974 and a Teaching Certificate in Art Education with post graduate classes in 1979. She is also a member of the National Association of Female Executives, the Scottsdale Area Association of Realtors, the Arizona Association Realtors, the National Association of Realtors, Kappa Delta Pi National Educational Honor Society. In 1992 Lynne was honored with the Gainey Ranch Realtor Recognition award. In 1993/94 she was the Director of the Luxury Homes Division of West USA Realty. In 1994 Lynne received the Extra Mile Award "Honorable Mention" from the Scottsdale Affiliate Committee. In 1995 she was honored by the American Biographical Institute with the prestigious nomination by the governing Board of Editors for inclusion into the Eighth Edition of Two Thousand Notable American Women. In 1995/96 she was also nominated by the International Biographical Congress in Cambridge, England for International Woman of the Year for recognition for her services to Real Estate. In 1996, 1998, 1999,2000 and 2001 Lynne was honored with her inclusion into the International Who's Who of Professional and Business Women. Lynne has also served on the Research Board of Advisors for the American Biographical Institute and also on PC Magazines Reader Advisory Panel. 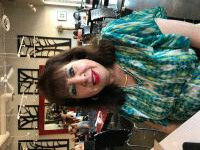 Lynne has written numerous articles,short stories, poems, original recipes, entertainment reviews, travel reviews, restaurant reviews and news articles for Yahoo Voices, which have been published for viewing on the Internet. Lynne previously was licensed by the Maryland Department of Education as a certified teacher for grades 7-12. Lynne also owned Floral Naturals a Commercial Floral Business in Burke, Virginia prior to moving to the State of Arizona, which is also licensed within the State of Arizona. She has been a member of the Arizona Miniature Horse Association. She is also a registered breeder with the AKC and Purina Corporation of yellow Labrador Retrievers and resides in Cave Creek, Arizona. Lynne also is a freelance writer with various Internet publishing companies. You can make an appointment to meet Lynne in her Scottsdale Office to discuss your real estate needs...whatever your needs she is there to assist you...with the members of her support team. Remember..."SHAPIRO A NAME YOU CAN TRUST IN REAL ESTATE"